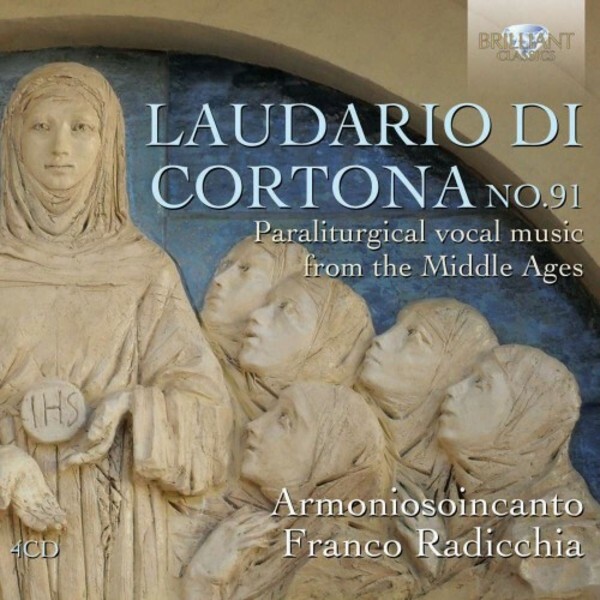 The Laudario di Cortona was discovered in the library of a monastery in Cortona, Italy. The 13th century manuscript contains a wealth of Laude or Lauds, songs written in the popular language for praise and worship. Thematically they follow the liturgical year of Advent, Nativity, Epiphany, Easter and Pentecost. They are the earliest examples of sacred songs in the common language found in Europe. The ensemble Armoniosoincanto makes use of female voices, and is accompanied by a variety of contemporary instruments like hurdy-gurdy, lute, vielle and a positive organ, thus presenting a lively and colourful rendering of these ancient songs of worship, enhanced by the atmospheric recording in the church of the Monastery delle Suore Clarisse in Arezzo. The booklet contains extensive liner notes.